August 8, 2018- The Army on Wednesday paid tribute to four of the personnel who died during a counter infiltration operation in the Gurez sector in Bandipora district on August 7. Among those who laid down their lives included a Major. 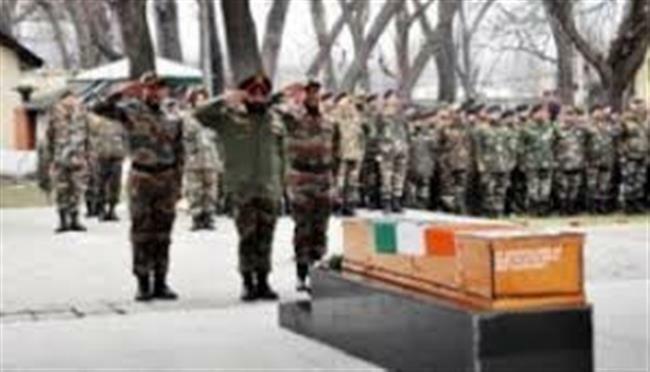 At the ceremony, all officers including Chinar Corps Commander Lt Gen AK Bhatt paid their last respect to the soldiers. Director General of Jammu and Kashmir Police SP Vaid was also present at the occasion. Those who died in the operation included Major Kaustubh Rane (29), Rifleman Hameer Singh (28), Rifleman Mandeep Singh Rawat (26) and Gunner Vikram Jeet Singh (25). After they sustained bullet injuries during the operation, they were evacuated to the Base Hospital immediately. However, they succumbed to their injuries later. Major Kashtub Rane, who had joined the Indian Army in 2011, hailed from Thane district in Maharashtra. He is survived by his wife and a son. Rifleman Hameer Singh who had also joined the Army in 2011 belonged to Pohkhriyal Gaon in Uttarakhand. He leaves behind a wife and a daughter. Hailing from Uttarakhand, Rifleman Mandeep Singh Rawat joined the Army in 2012 and is survived by his mother. In 2014, Ambala-based Gunner Vikram Jeet Singh joined the Army. He leaves behind his wife. The mortal remains of all the soldiers were flown to their native places for the last rites where they would be laid to rest with full military honours.